The Birmingham News, Orlando Sentinel and Savannah Morning News have joined DawgPost.com in writing about Coach Richt taking approximately 23 members of the Georgia Football Team to Honduras for a mission trip. The DawgPost article went into some degree of detail around the NCAA Bylaws which permit the trip. 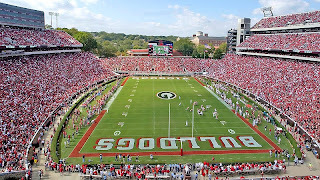 Apparently, Georgia's compliance office has been working with the SEC and NCAA to double and triple check the viability and appropriateness of the trip. Nice work to all involved. That's my boy, Arthur Johnson, keepin' "The Man" (NCAA) happy. I like that the NCAA doesn't consider the trip an extra benefit because there won't be any TV, air conditioning, or cell phone coverage.